Very few directors can strike the right balance between form and content. 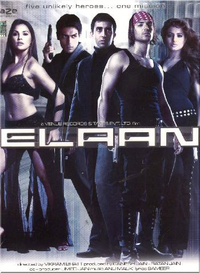 With a shoddy script, corny dialogues, mediocre music and a clichéd plot, there's not much hope for Vikram Bhatt's Elaan at the box office. It's a moment that defines the plot. Industrialist Karan Shah's (Rahul Khanna) father has been gunned down. A snoopy over madeup journalist from a real-life news channel sneaks into the tycoon's cordoned office building for some sumptuous sound bites.